The Visitor Center Complex, which includes the park headquarters, Exhibit Hall, indoor auditorium/theater, gift shop, restrooms and the nearby amphitheater, is wheelchair-accessible. It has multiple cement routes from the parking area (see a 360° view of this area). The Sauer-Beckmann Farmstead is a living history farm, presented as it was in 1918. The parking area and entrance to the farm are wheelchair-accessible. Due to the historic nature of the farmstead, it has no cement pathways, only hard-packed ground and paths with a caliche surface. Many wheelchairs can negotiate these pathways, though it's more difficult if the ground is very wet. The historic building entrances are not wheelchair-accessible. The Group Hall with a Kitchen has a wheelchair-accessible cement path from the parking area to the hall's interior. The inside is not fully wheelchair-accessible. 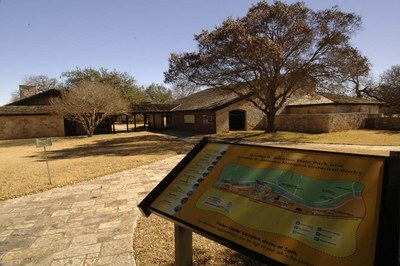 Directly across the Pedernales River from LBJ State Park is the LBJ Ranch, which is part of LBJ National Historical Park; check accessibility information for the Lyndon B. Johnson National Historical Park.